Now there’s plenty of games gamers may go to for their Halloween gaming, specifically horror and survival games like Resident Evil, Deadspace, or Silent Hill. While these types of games are all great choices to play on Halloween, I’ll be focusing on games that actually celebrate Halloween…I’m talking Pumpkins, costumes, and, of course, trick and or treating. Here we go. I mentioned the Animal Crossing series in my 4th of July piece, but it works for pretty much all holidays and occasions. With Animal Crossing’s internal calendar and clock it celebrates holidays in real time. For Halloween the game has a reoccurring character that only appears in your town on October 31st. Jack, the pumpkin wearing character, appears in your town each Halloween starting all sorts of Halloween festivities and havoc upon your town. Jack is kind of a jerk, asking you to do all sorts of strange things and, to be honest, he’s a little too obsessed with Halloween for his own good. One must ask: what does he do with the rest of the year? 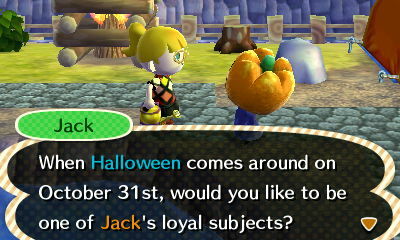 The other villagers will get into the spirit by dressing up like Jack, offering candy, and giving out Halloween specific items. So if you haven’t checked your town in a few months (Sorry Isabelle and Nook, Pokemon took your place in my 3ds) perhaps it’s time to check in with your town and enjoy some of the Halloween fun this Thursday. Honestly, this one I have not played but may give it a shot this Halloween. I have heard great things and it’s from trusted developer Doublefine, makers of the hilarious and great games Psychonauts and Brutal Legend. Anyways, what better game to play on Halloween than a game set on Halloween. The game places you in the role of one of two siblings as they seek out their sibling after they are kidnapped by a giant monster with a sweet tooth while trick-or-treating on Halloween. The game is a mix of adventure and RPG aspects, with the player being able to switch their attack styles by switching different costumes. For those of us too old to go trick-or-treating, why not go in the virtual world with this game. All in all, it’s supposed to be a really fun game with a Halloween backdrop that’s fun for all ages. Sounds perfect, eh. This one is moreso for the people who have already played Team Fortress 2, as you’re probably not going to enjoy it too much if you’re only going in for the Halloween fun because you will get massacred and cry . 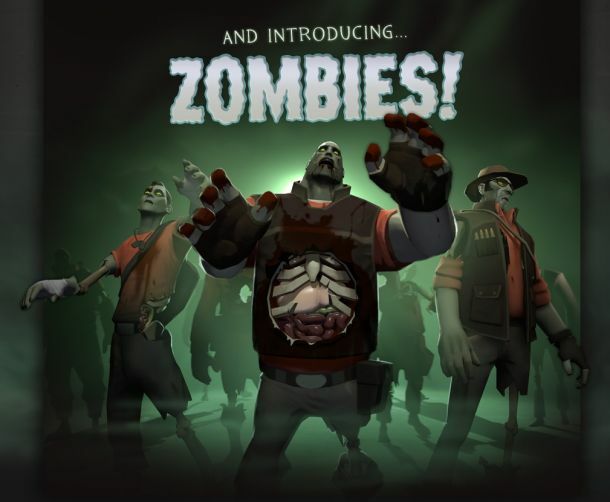 For the last couple of years, Team Fortress 2 has updated the game with Halloween specific skins and festivities each year. Many developers had little fun Halloween skins and other fun things each year (Ex: Minecraft, Uncharted 3, etc) but Valve really has been known to out do other developers when it comes to Halloween. So if you’re a Team Fortress fan, take some time and playing TF2 this Halloween. For those craving something a little older than those titles already mentioned, why not give Jersey Devil a try. The game puts you in the role of the infamous Jersey devil as he makes his way through levels filled with skeletons, pumpkins, and other Halloween related goods. The game may not be as favorably remembered as other PS1 classics like Crash Bandicoot or Spyro the Dragon, but it was a decent platformer for the time. Plus, it’s the only game to feature the elusive Jersey Devil, whom isn’t nearly as popular as the yeti or the eskimo. That said, if you can find this game in a bargain bin it’s worth a try. Last but not least is the Kingdom Hearts series. This one if more a guilty addition, as I they’re some of my favorite games. 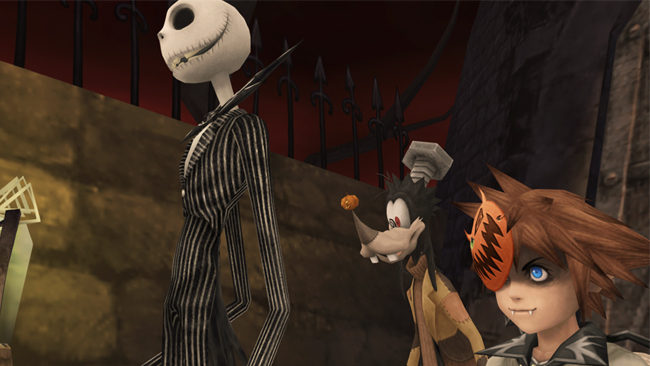 Many of the games in the franchise feature worlds based on the Tim Burton classic “The Nightmare Before Christmas”, which is the perfect setting for any Halloween Video Gaming. Granted, there’s a debate whether the film is more of a Halloween movie or a Christmas movie, and Kingdom Hearts 2 definitely deals with more of the Christmas side of the film, but regardless Halloweentown is certainly applicable and fun to play on Halloween. It’s also a great game with a great remake that was just released on the PS3, so it’s worth a play anytime of the year. So there you have it, some games to spend you last night of October with. Let me know what game you plan on enjoying this Halloween? This entry was posted in gaming, Uncategorized, video games and tagged animal crossing, Gaming, halloween, Nintendo, Video Games. Bookmark the permalink.